The Ins and Outs of Pro-Nox - Doctor Hermann M.D.,P.A. If you’re sensitive to pain or your nerves are preventing you from committing to a cosmetic procedure, working with a practitioner like Dr. Hermann is your first step toward a successful, comfortable experience. Dr. Hermann offers Pro-Nox to patients who want to be more relaxed and have less pain during their aesthetic treatment. 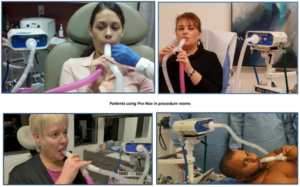 Pro-Nox is a patient-controlled pain management system that delivers a blend of 50% oxygen and 50% nitrous oxide to the brain through a plastic mouthpiece. After just a few in-and-out breaths, you will feel relaxed and ready for your treatment. Patients appreciate that because they know themselves best; they know how much pain relief they’ll need and can stop and start the gas as they require. Self administration of analgesics alone can relieve a lot of anxiety patients have over accepting such treatments. There is no fear of “not waking up,” the treatment wearing off, or being out of control of their pain levels. The effects of Pro-Nox wear off quickly once administration has stopped. After about 20 minutes, the gas is out of your system completely, so there’s no need to worry about taking extra time off or having someone with you during your cosmetic treatment. Pro-Nox can be used by all patients of Hermann Wellness in Tampa. Those with anxiety toward needles or increased pain sensitivity will love the relief that comes with using the Pro-Nox system. It works immediately to ease emotional discomfort and physical pain from a variety of procedures. If you’re getting Botox, Sculptra Treatments, or other injections, this pain management tool will take away the sting at your injection site. The slight discomfort of laser hair removal treatments can be wiped out, and the heat of laser therapy sessions will be non-existent. You don’t have to put off feeling confident in your skin any longer. At Hermann Wellness in Tampa, we want to make you feel beautiful and give you a youthful, glowing appearance. We offer Pro-Nox to all our patients so you don’t have to experience the anxiety that comes with having even the smallest procedure. Call us now to schedule your pain free consultation and treatment. Visit https://doctorhermann.com/pro-nox/ for more information.